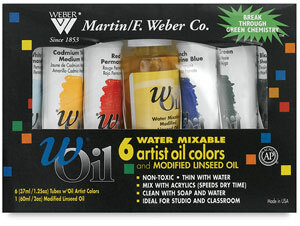 Set of 12 Tubes — This set contains 12 tubes in a 37 ml (1.25 oz) size of wOil Water Mixable Artist Oil Colors, including one each of Cadmium Yellow Light Hue, Cadmium Orange Hue, Cadmium Red Medium Hue, Alizarin Crimson Permanent, Dioxazine Purple, Cerulean Blue Hue, French Ultramarine, Sap Green, Yellow Ochre, Burnt Umber, Mars Black (Cool), and White Permanent. A 60 ml (2 oz) bottle of modified linseed oil is also included. Set of 6 Tubes — This set contains six tubes in a 37 ml (1.25 oz) size of wOil Water Mixable Artist Oil Colors, including one each of Cadmium Yellow Medium Hue, Red Permanent, French Ultramarine Blue, Sap Green, Ivory Black (Warm), and White Permanent. A 60 ml (2 oz) bottle of modified linseed oil is also included.